"Tell us to kill, we will kill. Tell us to die, we will die. Erdogan, Erdogan, Erdogan." Ankara (CNN) "Tell us to kill, we will kill. Tell us to die, we will die. Erdogan, Erdogan, Erdogan." As chants in support of Turkish president Recep Tayyip Erdogan's declared victory echoed through the Turkish capital Sunday night, nearly half of the country's electorate mourned the loss of what they saw as an already crumbling democratic nation. 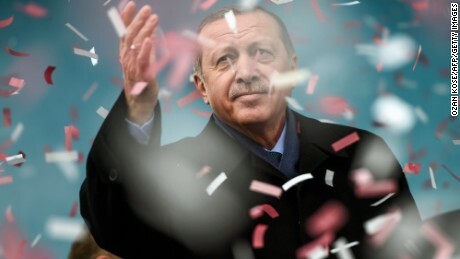 State-run Anadolu Agency reported a 51.4% victory for Erdogan's "Yes" campaign -- with 99.8% of the ballots counted -- although the Turkish Election Commission isn't expected to release the official results for up to another 10 days. In Ankara, scores of AKP supporters filled the streets, beating drums and singing victory songs in Erdogan's name. Turkish flags created a sea of blurry red as convoys of cars moved through the city's streets, honking in support of the referendum result. An ocean of supporters braved the pouring rain as Prime Minister Binali Yıldırım first delivered a message from the ruling Justice and Development Party's (AKP) headquarters in an effort to placate nearly half of the country who voted "No" to constitutional reforms that will give Erdogan unprecedented amounts of power. "No one should have an offended or broken heart," Yıldırım said. The atmosphere was one of contained chaos, as jubilant cries for Erdogan filled quieter breaks, respite from a loudspeaker that played the "Evet" or "Yes" campaign song on repeat for hours. In Istanbul, Erdogan held a news conference that was broadcast to the soaked crowd. "God willing, these results will be the beginning of a new era in our country," he said. He further explained that the unofficial totals indicated that "Yes" votes had prevailed in the referendum he called "no ordinary vote." 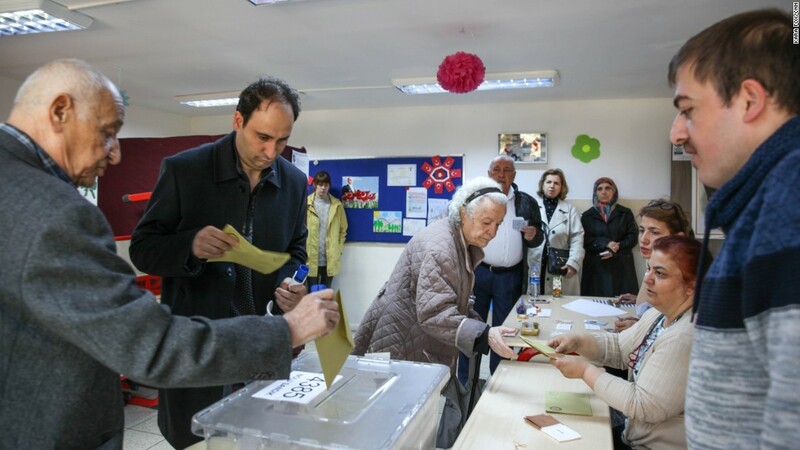 A woman prepares to cast her ballot at a polling center at a school in Ankara on Sunday. As the polls began to close on Sunday afternoon, the Turkish Electoral Board announced that it would accept ballots that were missing official ballot commission stamps -- a move that Kemal Kilicdaroglu, leader of the main opposition party, the Republican People's Party (CHP), said "change(d) the rules in the middle of the game." The opposition has called for a partial recount of about 37% of the votes, according to Erdal Aksunger of the CHP. Ankara residents cast their votes at a polling station in the Turkish capital on Sunday. As the opposition raged against the electoral board, the atmosphere at the victory rally remained steadfast in their support for their leader, with tones echoing the rhetoric of Erdogan's nationalist, conservative case that's dealt an increasingly authoritative hand to dissenting voices since a failed coup attempt last July. Since then, 100,000 people have been detained; nearly 50,000 of them have been arrested. But for Erdogan's supporters, he is invincible. Erdogan supporters dance to the "Yes" campaign song at a pro-Erdogan rally in Ankara on Sunday night. Guler Ozbicer crawled through crowds of thousands to speak with CNN. She wanted to reinforce the president's campaign message, which has called for national solidarity. "For one nation, one state, one flag, we are here," she said. The idea of one nation, however, is far from the reality. 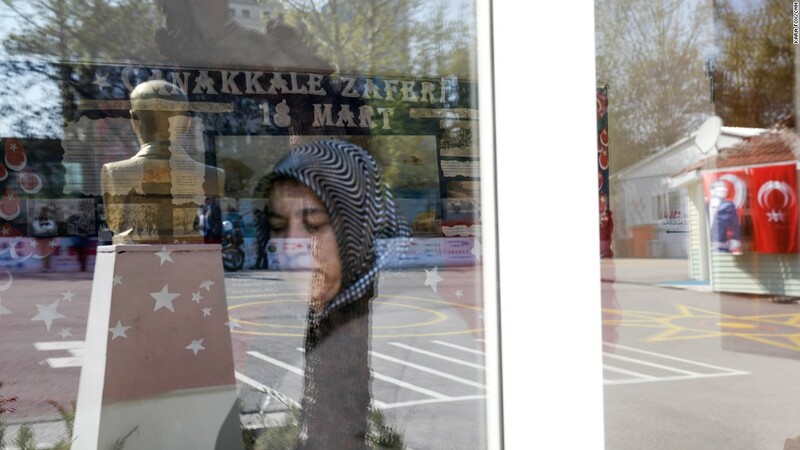 The referendum vote as it stands -- split only by a slim amount -- speaks to the deepening fissure between a secular middle class, voters who once flourished under Erdogan's economic incentives, and a rapidly sweeping religious conservatism. Still, those at the rally weren't shy to boast their support for Erdogan's fiercely conservative, nationalist rhetoric -- one that has strategically pivoted itself against both the main opposition and pro-Kurdish group HDP -- but also has butted heads with the European Union, a membership bid that has been put on hold indefinitely. 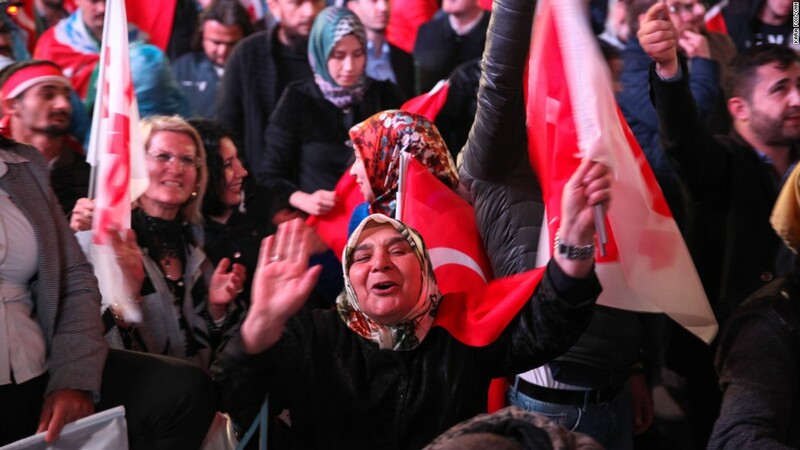 Aysel Can, an AKP women's branch member (L), said she voted "Yes" for a "strong Islamic state." 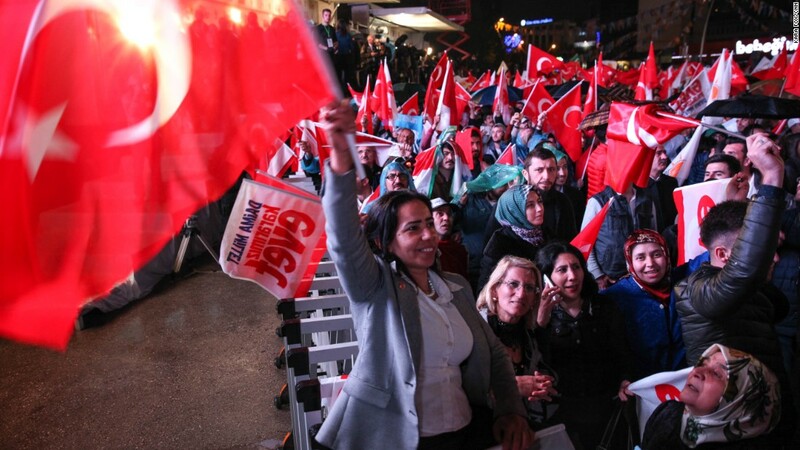 Aysel Can, an AKP women's branch member, was perched above the crowd, vigorously waving the red-crescent flag as the song of the "Yes" campaign blared in the background. "For a strong Islamic state, for a strong Middle East, Turkey had to switch to this executive presidency system," she told CNN. "This is a message to the world to shut up. Turkey is getting stronger. America has to know this, too. We are the voice, we are the ears, we are everything for the Middle East," she added. Yasin Yalcin, 24, (L) said the referendum gave him hope for Turkey to stand independent of "foreign forces." 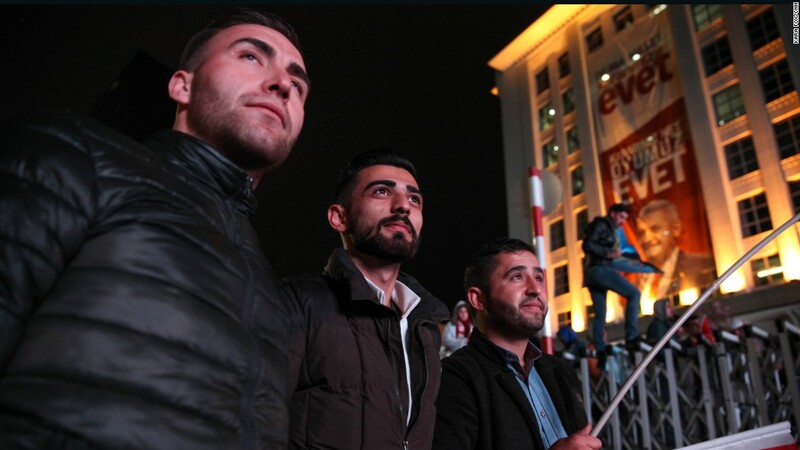 Yasin Yalcin, 24, was celebrating the result at the AKP rally in Ankara with his friends. "This referendum is a new start and a new hope for us to get rid of foreign forces -- and to stand on our own two feet. Israel, America and Germany are creating pressure over our country to take our money away from us," he said. Yusuf Basaran, a 20-year-old student, was celebrating on the street in front of the party headquarters with his friends. "Europe's spine has cracked. This referendum will be the most effective thing in the rebirth of the Ottoman Empire. Europe has to look at itself. We do not have to yield to torture." 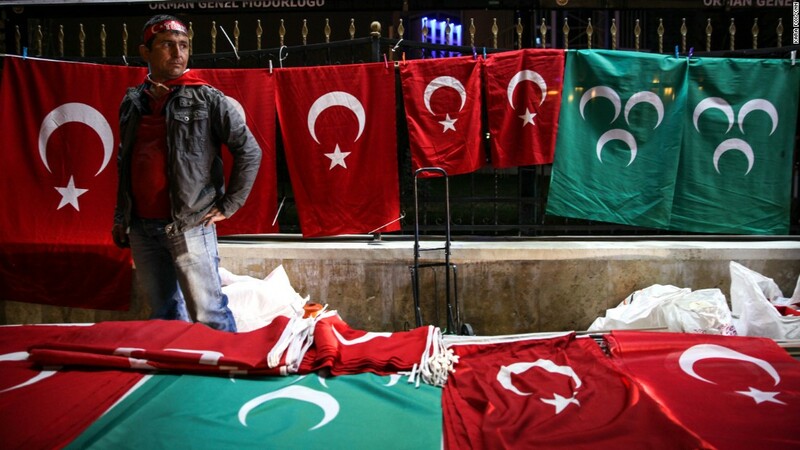 A vendor sells Turkish flag themed items on the night of the referendum result in Ankara. For almost half of Turkey's 80 million citizens, the growing pains of the referendum outcome could be severe. Dr. Ahmet Kasım Han, Associate Professor of International Relations at Istanbul's Kadir Has University, told CNN that regardless of the outcome of the referendum, it "reflects the profound polarization of Turkish society." "Such changes should be opportunities that strengthen the social contract," Han says. "They had to be administered and structured as such. However, it seems equally true that the change which is voted in today doesn't seem to offer a remedy for such polarization, and there are fears that it in fact could deepen the political and social divide that Turkey has been suffering from." 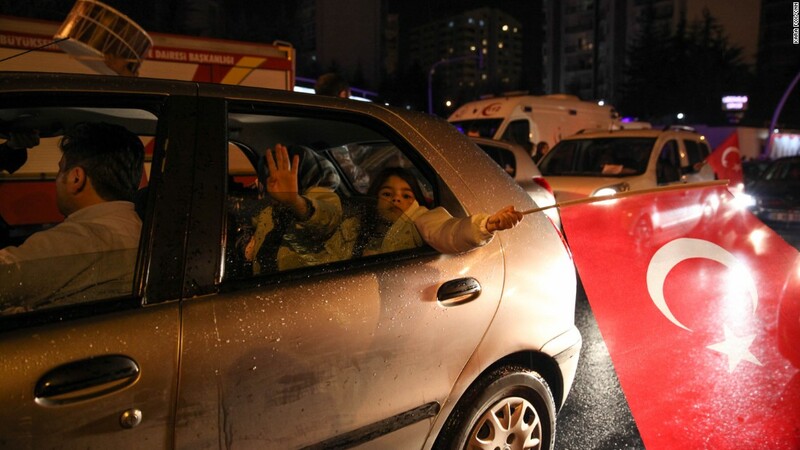 Erdogan supporters drove through the streets of the capital on Sunday night. As the votes trickled in earlier in the day, Feyza and Ender, both 33 and working in the financial sector, sat at a coffee shop in an upscale neighborhood near the rally that would take place later in the evening. If the "Yes" vote won, they told CNN, they were planning to move abroad as they feared their civil liberties and secular lifestyle would disappear under Erdogan's new rule. "I used to not be scared to give my opinions before, but now I am afraid to say anything. We can't imagine our future now. Let alone our children's," Feyza said. Mehmet Suvari, 28, who considers himself a nationalist, was smoking hookah at an adjacent restaurant. He predicted, "I don't think the supreme election board is fair, so even if the 'No' votes are higher than the 'Yes' votes, they have the power to manipulate the system to bring forward a 'Yes.'"